below An Outremer 50S tuning before the start of the famous La Route du Rhum. 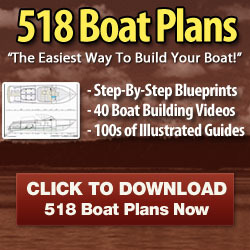 diverse characteristics of both types of boats. Why are multihulls generally faster and do people really get less seasick sailing them? In this chapter we objectively investigate advantages of catamarans such as their stable and spacious environment, low draft and the fact that beginner sailors feel more confident. But be aware, not everything is all roses. Although the well-designed and -built cruising multihull provides many rewards in terms of safety and handling, we will also investigate some of their drawbacks. Higher maximum and average speeds are what multihulls are all about and this is maybe the most important characteristic which lures monohull sailors to catamarans. L. Francis Herreshoff, a legendary American designer once said: "The fun of sailing is proportional to the speed of sailing." Let's be honest. Isn't it true that every single time we sail and see another boat heeling in the breeze, we want to catch it? Mostly we do it quite inconspicuously so that no one realizes that we are actually trying to overtake a competitor, but in the back of our minds we are always racing. Speed is more than just fun. There are times when we are actually participating in a race and by having a fast boat our chances to win are obviously higher. And what a joy it is to win! 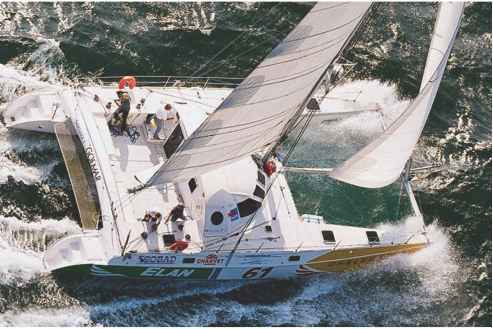 the end overtook a J-40 monohull with Kevlar sails, a boat that is considered by most to be one of the ultimate monohull cruiser/racers. The definitive speed comparison between monohulls and multihulls is most apparent at the annual Around Long Island Race (ALIR), which takes a fleet of ca.150 monohulls and a dozen multihulls past New York City, in a 220-mile offshore race around Long Island. The multihulls usually start about one hour after the leaders and it is not uncommon for us to have overtaken the entire fleet within the first 40 miles of the course. I have participated in 5 ALIRs and every single year we have an upwind start into strong headwinds. Many proponents of monohulls will say that sailing upwind is not the strength of catamarans, yet it is always on that first leg sailing to weather, where we pass almost the entire fleet. It is interesting to see monohull crews in their full foul-weather gear acting as "rail meat" taking spray, while we blast by on the level with cocktails on the cockpit table discussing sail trim. Speed has won wars, turned commercial fisherman into wealthy business entrepreneurs and has been also a contributor to safety. In battle, a fast warship could outmaneuver its adversary or even run away from a boat with more firepower. Higher performance meant that Gloucester schooners, 100 years ago, could race against each other back to port and offer the freshest catch at the highest price. Just as in history, speed of a sailing yacht is important and gives a faster yacht more options. 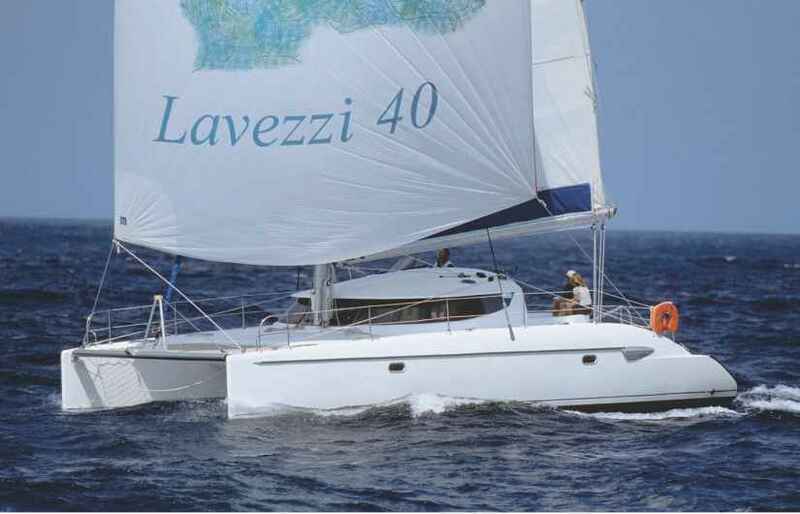 above The new, all infusion-built, Fountaine Pajot - Lavezzi 40, powering along under asymmetric spinnaker. 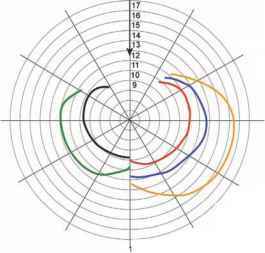 The polar diagram illustrates the varying speeds attained by a multihull, especially off the wind, where performance differences can be as high as 50% as compared to monohulls. Personally, the most important benefit of speed of a multihull is the ability to outrun bad weather. Being able to average 11 knots on a catamaran, rather than 8 knots as on a monohull, will give you more options in your strategy of avoiding bad weather. Getting to your destination quicker and shaving off days on a transatlantic voyage will simply mean that you have mathematically less chance of getting the toilet clogged, running into a submerged container or falling overboard. Thanks to advances in radar, satellite and computer technology, a five-day forecast today is as accurate as a two-day forecast was in 1980. A multihull's higher speed will greatly contribute to easier and safer planning of ocean passages around weather windows, since exposure time will be less and meteorological prediction for shorter periods more accurate. Being able to sail faster will also introduce the concept of apparent wind to the strategy of efficient sailing. Sailing upwind, the multihull will usually experience more apparent wind across the deck since she is sailing faster, hence the sails will feel more pressure, making the boat perform even better. The concept of apparent wind will greatly contribute to the joy of sailing, as it adds another dimension. When sailing towards a downwind destination, fast multihulls will be able to sail at smaller wind angles, often bringing the apparent wind forward of the beam, optimizing the angle of attack on the sails. Whereas multihulls will fly gennakers, Code-Zeros or asymmetric spinnakers, monohulls in contrast will set symmetric spinnakers off clumsy poles. Their boat speed will often cancel out the true wind, reducing the apparent wind and performance. The faster the multihull is the more she will be able to take advantage of the apparent wind and tack downwind towards her destination. Although she might be sailing twice the distance, she will arrive at the downwind mark quicker because her Velocity Made Good (VMG) will be faster. Which are safer catamarans or monohulls? Do monohull boats go faster than multihull boats?